In preparation for the big “December patch” as it has come to be known, Bungie’s Jon Weisnewski released a list of future weapon changes that will undoubtedly affect the future in meta in a few major ways. Swain, Birds and Bones break down each change and explain how it might affect the Crucible. This week we’re introducing a new recurring segment with friend of the show Sports Psychology Steve! He drops by to teach us about “visualization” and will be back with more sport psych tips! 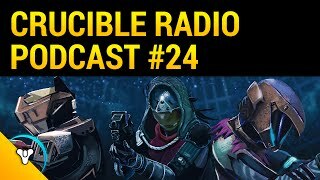 The guest of honor this week is Ms. 5000 Watts who joins the guys to discuss Trials, breaking down a map, Iron Banner Clash and MUCH more!